Here was the... what should I call it... parlor?... before we painted it pale gray. Wait, it looks even fancier if I spell it "parlour." Now the parlour looks like this. I'm delighted with how much better the stained glass window shows up against paler walls. I took photos at two different exposures and pasted the stained glass back into the shot above so you could sort of see. The window is way more vibrant in person. Oranges and aquas. On sale, too. I ordered it last night. 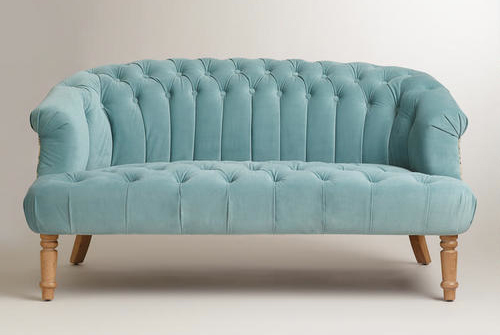 The Cloud Blue Abigail Loveseat from World Market. Doesn't it scream parlor? There ought to be something tufted and pretty in there. And also something a little crazy because we can't have it getting too stuffy— this thing has some sort of brocade fabric on the back side. I bet I could change that pretty easily whenever I want to switch it up. Also the legs should probably be stained darker. You see how I couldn't resist it, right? And on sale? I hope the quality is decent! I'll keep you posted. Update: It's here! I love it. It arrived in perfect condition and looks exactly like the picture. The cushion is fairly firm, so don't expect it to be like sitting on a teddy bear or anything. The fabric is soft and pretty. Lovely for lounging, and I feel happy every time I look at it. I'm so enjoying watching your new house come together. :) LOVE the blue sofa. Love it. So glad you ordered it! It's going to look fabulous in there! And what a room transformation! Soooo much easier on the eyes now. That color really does make the stain glass pop. Love that little tufted sofa! Definitely yes on the darker legs! But...You don't have a *Like* button! y e s!!! I adore World Market for this very reason!! Your parlor is coming together beautifully! It looks perfect. I'll be interested to hear what you think about the quality of the piece once it arrives. Can't believe you gave up the orange! 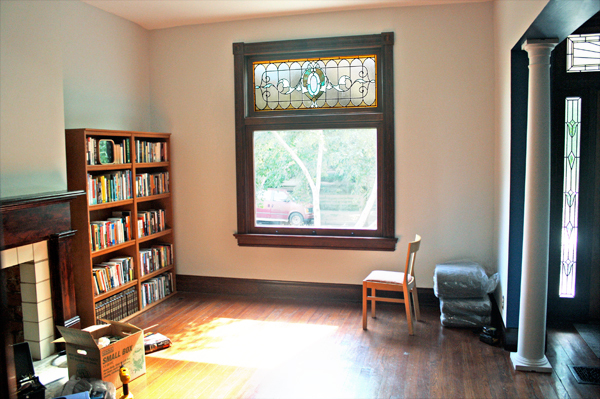 ...but I have to admit--it looks a lot better, and the window (I just spelled that "winder"), looks much lovelier. I love the couch. I want I want I want... Ummm. Sorry. As you were saying, that will look fantastic in your parlour! As does your stained glass window against the grey wall. Love the love seat! It's perfect. I can't get over the amazing difference that a well-chosen wall color can make. It looks like a different room. And I do love the tufty parlour seat. Where will it go in the room? It 's perfect for your room and window! I literally just sat on that sofa at our World Market this afternoon... I started to "lounge" on it but my son gave me the evil eye... It is simply lovely!!! And your stained glass window... delicious! Especially with the grey paint! That sofa definitely whispers, "front parlour" and will look comfortable against the dove walls. Waiting for the next pic. Mahalo for sharing. We don't have World Market in Hawaii. Gorgeous choice! And the pale grey walls make a ridiculously good difference in how your room looks! Gorgeous! I LOVE World Market...so sad there's not a store where I live (but my bank account is thankful). That parlour sofa is fabulous and the stainglass is stunning. It's so fun to see your old house decorating take shape. It's been so fun watching you transform your house... I'm already looking forward to the next installment! The colors and loveseat (can we please call it a "settee?") are perfect. As you already mentioned, blue is the best backdrop for orange accents. Will you use one of your fabrics for throw pillows? Please show us more pictures as it all comes together! Just wanted to say I love seeing the before and after pics too! wow, that before color did the room zero justice. Can't wait to get it! I'll keep you guys posted on the room and the "settee" (heck yes, let's rename it!) when it arrives. Whoa! I didn't even notice the beautiful window in the orange paint photo! What a lovely difference the grey walls make!! Nice! 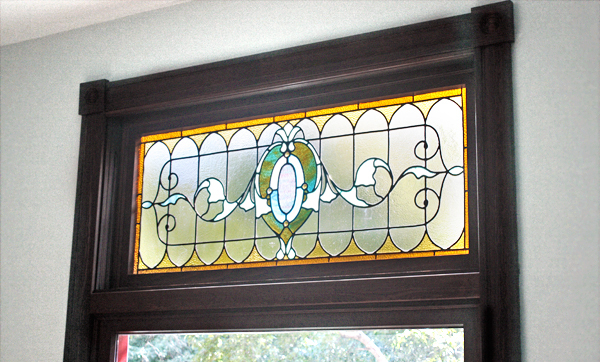 The stained glass is beautiful and really pops better with your new paint color! I love the loveseat. Can't wait to see the room come together! I am interested in how you ended up with the pale grey choice (I am NEVER able to choose a color or shade with confidence). It appears that the grey resembles the opaque area of the stained glass--did that have anything to do with it? Or does it just look so great because it's a "neutral"? Thanks in advance! Admire your talent and beautiful creations!! beautiful beautiful beautiful! keep up the good work! your house is very happy with you! 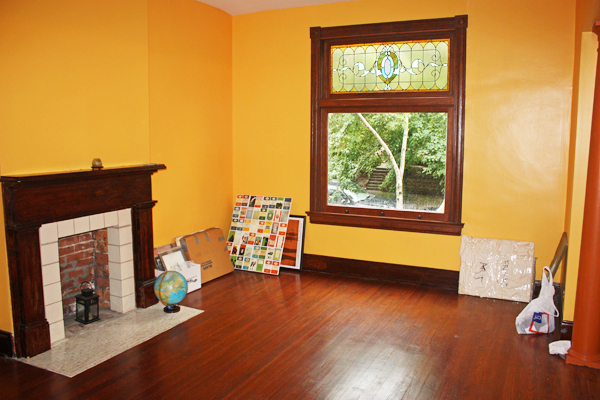 1) The woodwork is quite a warm brown in person, with red tones, and the window has lots of orange in it. So anything red or orange would tend to make the window blend in and disappear instead of pop out. So we need the opposite of that: a cool color. 2) The room has dark floors and trim, so to brighten it up and keep it from looking like a cave when the sun isn't shining in, we need a pale color. 3) Cool + pale could be light blue, light green, light gray, light lavender. 4) Grays and blues coordinate best with the window, as you said. 4) Now it's down to personal preference: I went for gray so I could have the furniture and curtains be any crazy color and not have to coordinate as much with walls that have a tint of a color. Plus I just like gray. It's current and modern; beige is out! Gray is in. 5) Then she got samples which we slathered on a wall first to compare and see which looked the best. Oh yeah! I forgot that part. I got a couple light grays to test, sample sizes. Thank you (and Grandma G) for Color Selection 101. Great explanation! I have printed your comments for future use. Thank you again for the inspiration and guidance! !